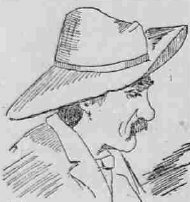 On this date in 1894, Enoch Davis — condemned for the fatally pistol-whipping his wife, who was planning to leave him (you’ll see why in a moment) — was shot to death at Lehi Junction, Utah. We have some affection in these pages for men or women who do not “play the man” (or woman) at the end but die in piteously naked humanity. 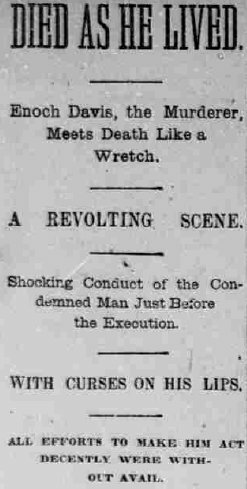 Davis got started well before the last hour; according to this review of Utah’s notable executions, he kicked off execution day by asking his jailers if he could enjoy one last … prostitute. Maybe that would have chilled him out a little. Now those are last words we can all enjoy. Beyond the newsmen, and about 500 residents of Provo, Lehi, and environs who assembled for the show, the audience included the six anonymous members of the firing squad. In order to secret their identity, they had been carried to the site in the dead of night and situated in a tent: they would not emerge until the following nightfall. Holes cut in the canvas provided their firing positions on Davis, staked out in a bar seat that was (for obvious reasons, but also because Davis was by that point too drunk to sit straight) as securely nailed down as the officiants could manage. Davis objected to everything else, and of course he objected to this too. “Let me see ’em! Let me see them men who are going to kill me!” the doomed man carped, not wanting to “die like an Indian.” Odd phrase, but he was a little stressed out. That part, at least, went off without a hitch. Like an Indian, like a cur, or merely like a weak and wicked villain, Davis succumbed instantly to the volley. His own cowardly tears fell through the foulest of breaths during his last hour, his complete lack of nerve … might have won him a little human sympathy if it were not for his vile and lying tongue. 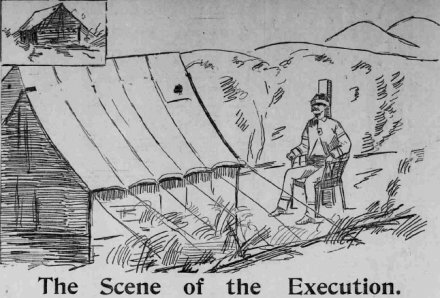 This illustration (and the sketch of Davis above) both from the September 15, 1894 Salt Lake Herald.